In my 35 some-odd years of watching political events, I can’t recall any event where so many Democrats were so busy trying to shove one of their own under the bus. Even in the Jim Trafficant case, the accused had defenders. Not so here. And I can’t help but think that Blago would be well defended today, with Democrats coming out of the woodwork to defend him, as they did Bill Clinton and so many others, had John McCain won his White House bid. 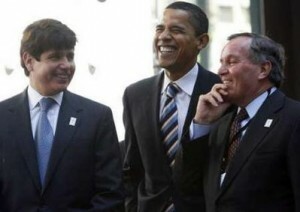 The common perception Democrats seem to be operating under is that Blago going down will aid in the defense of Obama. But why on earth would Obama need a defense? Even the press, and a lot of the blogs of course are now saying Obama has been exonerated. Clearly, that’s a meme that the Democrats in the Dinosaur media and the Democrats in politics are trying to sell us. Thing is, it’s not true. Fitz only said that Obama was not involved in the original complaint. Since when, dear reader, has Fitz, or any special prosecutor, been limited to the original complaint, once the investigation is underway? Scooter Libby, and Bill Clinton, call your office. Obama as you might expect, is acting as if he knows this, and is playing his cards very close indeed to the vest. Ben Smith is reporting that Obama’s transition website has basically banned any questions or comments regarding Blago, and Obama’s involvement, even though the questions are still very much out there. Worse, it’s been noted that stories about Obama meeting with Blago are disappearing from the net. This obviously doesn’t strike me as the actions of a person, or group who finds themselves secure in their positions. It’s obvious that Obama and his people are not being fully open with the American people. But it is instructive to note that this is the political culture that nurtured and raised Barack Obama. To think that it hasn’t tainted him is just plain idiocy. There are plenty of examples of Obama using his clout to help a friend or crony not to mention steer government business to campaign contributors. Obama lived, breathed, ate, and slept Illinois politics for more than a decade. And that’s something to keep in mind as his Administration rolls along. I suggest this point hasn’t been lost on Obama and his people, which explains the ‘protect at all costs’ attitude, instead of the “openness in government’ he promised. Let’s remember, Blago, too, ran on that platform; openness, anti-corruption, being for the people, yada yada. Blago claims he won’t resign. I wouldn’t expect that he would resign, so this is no shock to me. Anyone watching this knows he’s not going to hang onto his chair. He knows it, too. So why is he hanging on in spite of it all? No, he’s not nuts. He’s engaged in political pay back to Obama, because that’s how the game gets played. This is Illinois, after all. He knows very well that Obama needs this to go away in a hurry, lest something be uncovered, and as Moran points up the idea that there is not something there to be uncovered, strains credulity.. The longer he keeps this in the spotlight, the better chance of something on Obama leaking out. He knows it, Obama knows it, and so does the press. Which to make the circle, explains why there’s such a panic to get Blago under the bus. But if it was just Blago, would Obama and his people be so nervous? I think not. This boat has more than one hole in it, big as it is; Rezko is apparently singing like a caged bird should. WaPo confirms this. This would explain the reaction of Obama’s people, and of Obama himself. Jesse Jackson Jr, who will in future years be better known as “Candidate Number 5”, … (in muchthe same was as tanother famous Democrat here in NY became best known as ‘Client Number 9″ while hanging out with someone who apparently came over at the Mayflower pretty frequently…) is also a native of Chicago shakedown politics. His is a name that will come up frequently in the next few months. Personally, I’m waiting for the first moron to claim that them ‘dragging him into this’ is all the actions of a racist nation. One gets the feeling he’s possibly going to be removed from his seat in the lower house before this is all over. Even if that’s worng, and he manages to hold his chair there, (which strikes me as possible, given the makeup of the Congress in the new year, depending how how much his being around jeopardizes Obama…) he’s not going to be the one replacing Obama. Look for Bobby Rush’s name to come up, now. Oh, speaking of Jackson, did anyone notice his old man getting involved? Amusing,a nd rather telling, I think. The New York Times is now trying to put a positive spin on this, as you might expect, saying that this is all a test for the Obama team; their first. What they don’t say, but I will, is that so far, the test results are an abject failure. They’ll never tell you that, of course. And they’re not happy, not happy at ALL, about the right’s reaction. My guess is Blaggo has a divorce in his future. Long term, anyway. No, I’m not getting into wishful thinking, here, I really couldnt care less, either way. But the signs in the reports of family friction are all there. And here the hell is Rahm Emanuel in all of this? Nowhere to be seen. Apparently someone thinks the information his might disclose wouldn’t be helpful to keeping The Chosen One out of trouble. Remember the Burger King workers that got canned for taking baths in the kitchen sink? Apparently it happens at KFC, too. This issue aside, I’ll tell you that we tend to not partake of KFC in the major cities, opting instead to the ones in the smaller towns, more recently built. 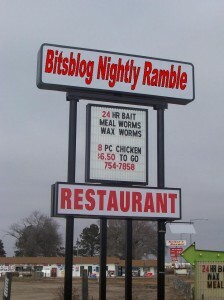 Usualy, this means ones that share space with Taco Bell; both of them being owned by Pepsi. The old style places, particularly in the big towns, don’t strike me as being overly clean or well maintained. 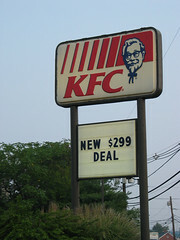 we’ve had good luck with the KFC/TB at Fredonia, NY, for example. Harlan Sanders, the founder, and the guy whose picture still graces the signs and such, and who was notorious for his temper, would have a cow if he saw some of these places, and what’s become of his business. That said, let’s examine this from a behavioral point of view for just a moment. Do you suppose these girls got the idea from reports of the Burger King incident? So much for the idea that the media doesn’t influence us… clearly they do, even when they’re doing their job… and that infleunce isn’t always a good thing. That sit-in at Republic is done. Not suprisingly, government took a hand, again. So, another bailout. I don’t suppose it’s occrred to those morons that absent the union, they’d still have jobs, huh? Word via email that Billy Beck’s mom is doing very well, and is up and around and getting used to things very quickly… all seems well. It’s good to hear. I make mention of this because Billy’s a friendly, but perhaps more importantly, because we could all use a little good news, where it happens. What global warming? Snow in Houston and New Orleans, too. The Death of the Dinosaur continues apace. Newsweek, this time. Faster, please. Why do I get the feeling there’s more to this story than they’re telling us?